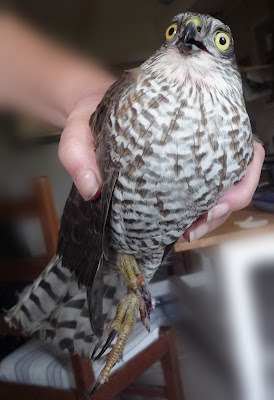 This is a beautiful female sparrow hawk, which I had just disentangled from the hedge after she had taken a low flight path to escape from me, when I caught her pinning down one of my fantails. It is the distinctively coloured female of the species, who preys on much larger birds than her name suggests. The male lives up to his name, preying on sparrows and smaller birds. I have witnessed the way the male attacks, launching himself at groups of sparrows perched in the bay tree in our garden. It's a strange tactic, he slams into the tree scattering the poor sparrows in all directions. The female uses the same approach on my fantails, she waits until there is a group displaying on the roof and then swoops in scattering them and knocking one to the ground. Birds of prey are protected, here but I wouldn't want to harm them anyway. By the time this second picture was taken, I'd managed to get my gloves on. As the bird was in shock, I'd given her a little organic sugar in water. She repaid me by coming round and squeezing my fingers with her claws, ouch! We then took her in the car to a beautiful wood away from human habitation and let her go. Birds of prey, like rats and other predators of poultry are opportunists and my fantails parading up and down the roof ridge are invitation enough. The whole of our garden has been planned to give our birds as much protection as possible to free range. My strategy has always been to plant up our garden in such a way as to prevent easy access by fly-through and thereby also give my fantails, if ever attacked, the chance to escape. Knowing my birds as I do, I am well aware of that avian memory retention is better than that of most humans. A sparrowhawk, may return after I have scared her off, alerted by my hens and cockerels, to see if she can get the abandoned prey but she rarely makes a third mistake with the hens and I on duty. There's not much comparison really when you think of the fighting capabilities of fantail versus sparrow hawk. I hadn't associated this young female seemingly sitting on eggs under the workbench with the drops of blood and few feathers on the stone path in front of the workshop. Unfortunately I just presumed this was evidence a new sparrowhawk had carried off one of my birds and so I left her alone for a couple of days. By the third day however, as I hadn't seen her come out to eat, I thought I should remove her from the nest. Young birds can become fixated on sitting and forget to look after themselves. It was then that I found that she had been badly injured under her wing and this left untreated had become infected. Perhaps if she had been out and about instead of cowering under the bench the wound would have begun to dry and heal, even though deep, but now it needed intervention. This is what I did and I hope if this ever happens to one of your birds it will be of help. Interestingly enough she had obviously not been affected by stress, although a previous attack had left a fantail flat out on the ground and completely unable to stand purely from stress. In this case I had administered emergency stress treatment, you can find that HERE It can be used on all sorts of poultry and I have also used it with great success on rescued wild birds. Montmorillonite - Illite or (French Green) clay is one of the most amazing natural minerals, its primary use is as a detox for the body. Always choose a good quality sun-dried, powdered clay from a reputable source, it is not expensive. It can remove bacteria from wounds and also pull heavy metals and even radiation from the body, with both internal and external application. I have also used it to great effect on sprains and a friend has used it to successfully set her dog's broken leg! 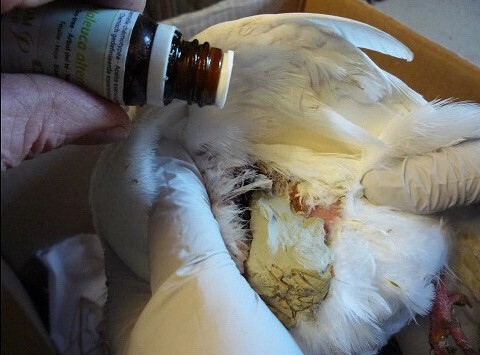 In the case of my pigeon, she was in such a bad state that I didn't consider how I would remove the clay. Normally a clay compress is only left on until dry. I just knew I needed to pack the wound in her side. This was both to seal it from further infection and remove that which already was within the wounded tissue. 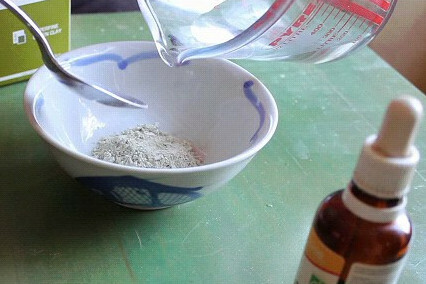 Clay is always mixed by putting the powder into the recipient first and then adding water, this is the easiest way to gauge exactly how much water to use. Due to the clays ability to remove toxins, only stable substances such as glass or porcelain should be used to mix the clay, above all do not use plastic. You should also use good quality water too! Update - I have since found, that the metal spoon will have an ionic reaction on the clay that is in direct contact with it - a tiny amount but even so in future I will use a wooden, glass or ceramic spoon. 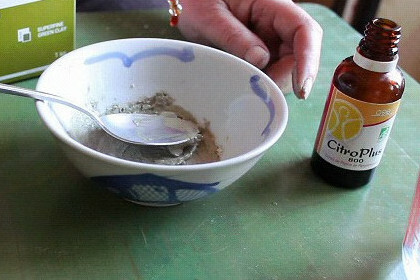 In this case of an infected wound I would also add a few of drops of organic grapefruit seed extract to the clay and mineral water mix. This is a powerful relatively recently-discovered naturally occurring antibiotic, it is one of the few things which can control MRSA. Mix this in well to your clay mix so it is evenly distributed. 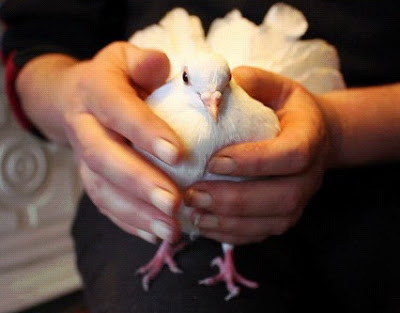 Just a word about this pigeon, I knew from the start, despite the gravity of her wound that she was OK because she was eating and drinking and responding to me in a normal manner. I wasn't sure, as the wound was so deep and infected, if it would clear just with the one treatment. 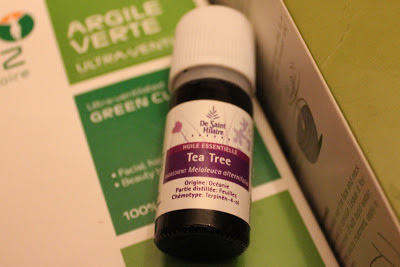 On the next day after treatment, I could still smell the wound, therefore, I decided to follow up with Essential Oil of Tea Tree. This is a powerful broad spectrum antibacterial agent and a good one to have in your first aid kit. Always get a good quality pure oil, mine is organic from a local company. It is worth paying a little extra and remember you are only using so few drops for each treatment, a small 10ml bottle will contain approximately 200 plus drops. Following advice from my sister, who has used Tea Tree on her cattle I fed it directly into the wound, a couple of drops on the clay and one down the side. Tea Tree is one of the few E.Os that can be used neat in an emergency. Personally, I would never use more than three drops of E.O. on a bird per day. Most of my birds are bantams thus with low body weights. Also and as with human adults I would not treat for longer than five days at a time without a break. I have never in my experience had to treat after the five days. My next problem, when after three days of treatment with Tea Tree the wound was clear of infection, was how to remove the clay. Luckily the problem was solved for me as the pigeon cleaned it off herself! She was left with a scab a fraction of the size of the wound surrounded by healthy looking pink skin. I was so pleased that something so terrible and deep had healed so well and that she could still and does fly. I did notice however, that she was quite careful about bathing for some time even after the wound had healed. Here she is at the pigeon lido wondering whether to go for a dip! If you'd like to watch the film. If you enjoyed this post then please share and do feel free to comment, ask questions and share any of your own experiences of using green clay.Thanks for dropping by and hope to see you again! Thanks. Green clay is a brilliant addition to any first aid kit. I use it on wounds to stop bleeding and also, as here externally, in drinking water for infections and as a detox. It is also such an inexpensive treatment in particular if you buy it in powdered form. I've also used it on myself as a poultice when I heaved a perch about in the cold and injured my back, it worked really well! Where can a person buy organic grapefruit seed extract?